Perfect for those on busy schedules, Gourmia’s Smart Pot has a 24 hour delay timer and an auto timer. Program meals at your convenience and have them ready right on time; it’s the ultimate set – and – forget! 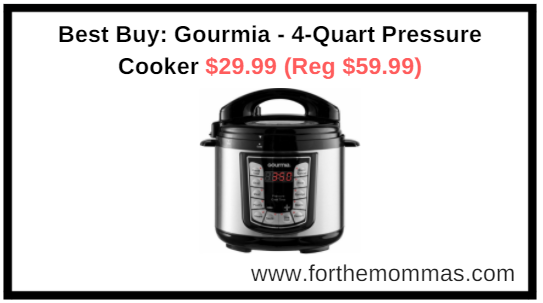 Best Buy is offering Gourmia – 4-Quart Pressure Cooker for $29.99 (Reg $59.99) in the deal of the day 01/16. Choose free in-store pick up to save on shipping charges. Gourmia’s Smart Pot also features steam and sauté options, so you can prepare whatever you like at the touch of a button. Enjoy the convenience of a one pot wonder that yields fantastic results while reducing cooking time by up to 70%.